It's no secret that pop princess Taylor Swift has a pretty impressive posse of famous friends, but she's recently been showing off with some of her slightly-lower-on-the-pop-charts pals. First, she enlisted HAIM to join her on her current tour in support of 1989 — an album that is now being covered in its entirety by Ryan Adams. 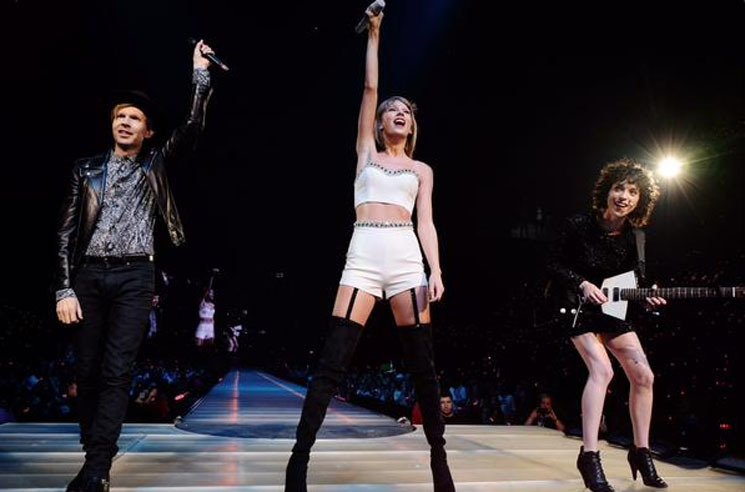 Then, following a string of high-profile onstage cameos throughout the tour that has included everyone from Lena Dunham to Serena Williams to Alanis Morissette, Swift brought out the indie rock tag team of Beck and St. Vincent last night (August 25). Performing at the Staples Center in Los Angeles, the trio delivered Beck's summer hit "Dreams" to an arena of screaming tweens. Beck matched Swift's awkward dance moves, while St. Vincent strutted up and down the stage, shredding her guitar against a backdrop of pyrotechnics. It was awesome. Watch fan shot footage in the player below.